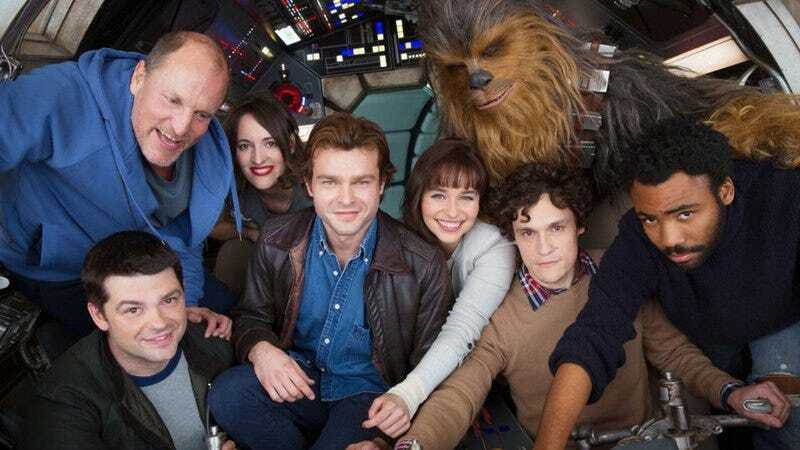 According to The Hollywood Reporter, directors Phil Lord and Chris Miller have dropped out of the Han Solo movie, delivering what seems like it could be a huge blow to the Star Wars spinoff. In a statement, Lucasfilm president Kathleen Kennedy referred to Lord and Miller as “talented filmmakers” and noted that they’ve “assembled an impressive cast and crew,” but apparently the two of them and Disney/Lucasfilm had “different creative visions” for the Han Solo movie. Lord and Miller (who previously directed The Lego Movie and 21 Jump Street) also released their own statement, echoing the same basic sentiment as Kennedy’s and also highlighting the “amazing and world-class work” of the cast and crew. Speaking of the cast and crew, Disney just released a photo of the whole cast—including Alden Ehrenreich as Solo and Donald Glover as Lando Calrissian—back in February, and filming had been happening since January. Sources say, there were only a few weeks to go on the shoot, so these creative differences must’ve really popped up recently. Lucasfilm definitely doesn’t want anyone to worry, though, as Kennedy has said that a new director will be named “soon,” and THR points out that the release date of May 25, 2018, has not been changed (yet). The source pins most of the blame on Kennedy’s insistence on doing things a certain way, which resulted in her refusing to give Lord and Miller “the leeway to do what they had to do.” Because of this, the source says it has been “a very polarizing set,” which makes it sound like some people wanted to do things the old way, while others wanted to follow Lord and Miller’s lead. Basically, none of this looks good for the Han Solo movie.